In this masterclass, Phil tackles the subject of harmonic rhythm. 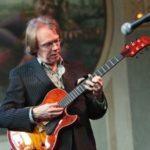 After a brief musical introduction based on the chord sequence of the classic standard Autumn Leaves, he goes on to explain that harmonic rhythm, in a jazz context, simply means where the chords change from one to another, within the structure/form of the tune or song being used as the foundation. Phil has chosen to use simple turnarounds and a standard 2 5 1 type framework for his examples, although he clarifies that all the concepts given can be translated to more contemporary material. This is because the central theme of this class is the manipulation of cadences, and this is in some ways a continuation and expansion from his first video for Mike’s Master Classes ‘The Diatonic Equation’. Both classes, however, contain very different approaches & information. Phil was keen not to take a ‘learning licks’ approach to this subject and rather prefers to explain the concepts being used in depth, in order for the student to apply and explore this further. However, Phil will be supplying additional complimentary written material with the video. This will contain clear examples of the concepts being used in the class, which can be learned initially, in order for the student to fully grasp the principles being used. As the video progresses, Robson looks at various ways that small cells such as two bar and four bar phrases can be divided & broken up etc. and goes into fine detail regarding the harmonic & rhythmic changes necessary to achieve various effects of anticipation and delay. This is demonstrated over both major key & minor key turn-arounds. Another key topic within the video is on displacing basic and more complex phrases rhythmically within the bar. Phil gives clear examples of the effect that moving a phrase by one quarter note or one 8th note can have, especially within the context of repetition. Motivic ideas are also explored here, with ideas on how to develop phrases which are transposed in such a way that the melodic/rhythmic ideas are expanded upon, rather than simply duplicated. The latter section of the class explores playing 3/4 dotted rhythms & motivic phrases within in a 4/4 context. This encourages the player to begin to hear syncopated patterns which break up the two bar and four bar frameworks in a way which helps the student understand the concept of playing ‘thru the barlines’ in a way which is in keeping with the great jazz tradition. Ragtime, second line, Wes Montgomery, John Coltrane and more are referred to here. Finally, Phil explains that we have begun the journey into the exploration of harmonic rhythm with metric possibilities etc. being the subject of further studies and, who knows, maybe a further video from Phil in the future, although he adds that there are many sources available on this topic on the internet & indeed Mike’s Master Classes. Phil wishes everyone good luck and the video ends with a brief up tempo blues example from Robson. I added Phil Robson’s Harmonic Rhythm to my playlist because I was looking for other approaches for improvising and comping to complement what I am already doing. Harmonic Rhythm details the techniques of playing chord changes (ii-V-I-VI) in advance (anticipation) or behind (delay) of where they are written. Also, important is Phil’s discussion on phrase placement in relation to the beat and bar-line as a way of making some phrases standout from the rest in your improvisation and/or connect your melodic fragments to one another. Phil talks about how to change the feel of any phrase by setting it to different parts of bar. I am also using his methods (note placement and note duration) to embellish the written melody of a tune. Great video the handout alone to see his voice leading changes from the video. So many ideas to work on in the video from begging to end. I hope he does more videos for Mike’s Master Classes.